This is an early picture of the people who made Santa Clara Honda a successful Honda dealership and fun place to just hang around. Pictured in the back row from the left: Jack Wulzen - sales manager, Ed Milano - owner, and Stan Ward - mechanic. Seated on his racer, Jim Wulzen - parts manager. Both Jack and Ed had no previous experience in motorcycles. Over the next couple of decades many other very good people would join the staff before Santa Clara Honda eventually closed its doors for good. At the very top of the hierarchy is Mr Honda without whom we'd all still be riding BSA's. Jack Wulzen is our honorary general manager. Santa Clara Honda first opened with 2 employees. There was a mechanic and Jack filled all other roles. He passed away a few years ago but will live in our hearts forever. Jim Wulzen is our parts manager, paint and body man, and my co-conspirator on this site. He is a great source of information about Honda parts, interchangability, the good stuff in the back of the parts cataloges, and anything concerning paint or appearence. Jim has raced on both dirt tracks and road courses. 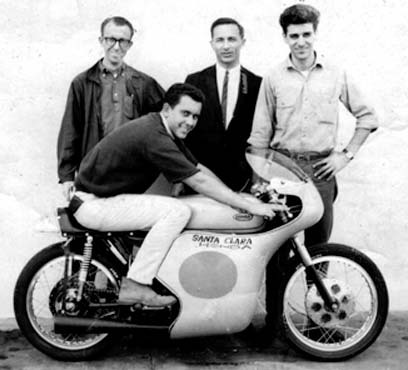 He built and raced a CB77 road racer, owned and raced a CR110, and built several custom Hondas (road racers, dirt trackers, and street bikes) for customers from both new and used Hondas. Mike Gould (me) is our chief go-for and apprentice mechanic. Mike raced a CL72 in scrambles and TT track events. He has saved dozens of old Hondas from the crusher by bringing derelicts back to life. Unfortunately, most of these ventures have been money losing propositions (Thats why it is called a hobby insted of a business). Terry Wulzen, daughter of Jack, is our office manger and bookeeper. Here she is, hard at work, cranking out our virtual payroll for our virtual employees. If you'd like to join our staff send us an email stating your interests, qualifications, and area of expertise. You must be willing to receive emails and answer questions. You will be paid the same as our highest paid employee, $0. But, the benefits are great, 365 days off a year.